With the Florida Gators switching to Jordan Brand ahead of the 2018-19 athletic season, everyone has been wondering what exactly the new football jerseys will look like. Spoiler alert: not much different than they used to. In fact, the new jerseys — though new technology and fabrics will likely be touted — look identical to the old ones with the exception of the Jumpman logo replacing the signature Nike swoosh. Even the widely-panned uniform numbers, which were changed the last time Florida updated its jerseys, remain exactly the same with this new iteration. Here’s a quick look at some pictures of the jerseys ahead of the Gators’ official release party on Tuesday night in Atlanta. 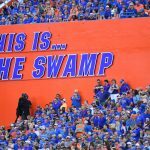 OnlyGators.com will update this story with more photos and information when available. 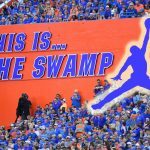 You can buy the new Florida football jerseys and check out the rest of the Gators’ new Jordan Brand merchandise by clicking here.